With the Compaq 6735b laptop, HP is looking to target those after an affordable work notebook that also want basic consumer features to keep themselves entertained. To a certain extent they've succeeded, and the machine could have been a good all-rounder, but performance is lacking. Due to its size, the 15.4-inch screen is great for working with multiple windows, making multi-tasking easy. The panel is brighter than many, but has a very average 1280 x 800-pixel resolution. The keyboard is mounted firmly in the chassis and there's very little flex when typing. The keys are large and evenly spread out, with a good action. We did notice a little stiffness in the movement – but this may suit some typing styles. The touchpad is large enough and features two click buttons which are constructed from rubber, giving a good purchase. The chassis is large and comfortable. Built from hard matt plastics, it features a patterned black and silver paint scheme which is more attractive than the Toshiba Tecra A10-16E. The materials are very durable and ideal for dragging around classrooms. It is rather heavy at 2.8kg though, and carrying the machine between places could quickly get tiresome. An AMD Turion X2 dual-core processor is in place, alongside 2048MB of dedicated memory. Performance is worse than we expected and, aside from your basic work, you're not going to be able do a great deal of multi-tasking or run resource-intensive applications. We managed to squeeze 221 minutes out of the battery, however, offering decent portability. A dedicated ATI graphics card is in place and features 320MB of video memory, which means that 3D performance is acceptable. We were even able to play some relatively recent games, albeit with the detail settings turned down. 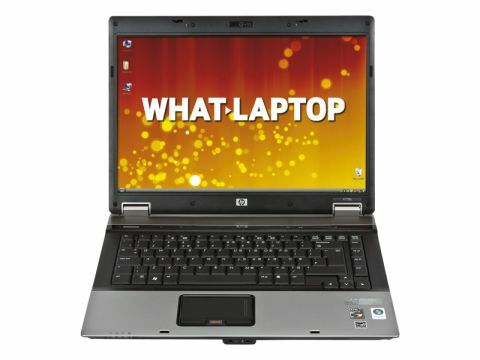 The integrated optical drive features LightScribe technology, a nice extra which most HP laptops boast. This enables you to burn images or text on to the surface of LightScribe-compatible discs, making them easier to catalogue. If you have mountains of DVDs with backed-up work on them, this could prove extremely useful. 802.11a/g/n Wi-Fi is in place for wireless internet access, as is Gigabit Ethernet for fixed connections. Four USB ports, a VGA-out, Serial port and 5-in-1 memory card reader round off the specification.